First of all, fear not that the Deep Chunk seeds are of a lighter color, they just are that way normally. Even the original P1 Deep Chunk that were from Tom Hill (via Moonshine Man) himself all were of lighter colors. I germ tested 10 very light seeds and got 8 sprouts, and I have kept three of them you can see in the photo of the youngster cutie-pies. 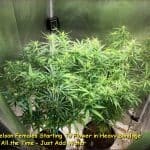 Also, you can see I am flowering a couple wild and crazy Willie Nelson sativas, and I’m trying to do this in 2-gallon pots, all TLO style just adding water; but I might have to use a single tea, we’ll see. 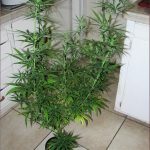 It’s a tall order and in the photo those plants are tied down something fierce, or they would be almost 4 feet tall. 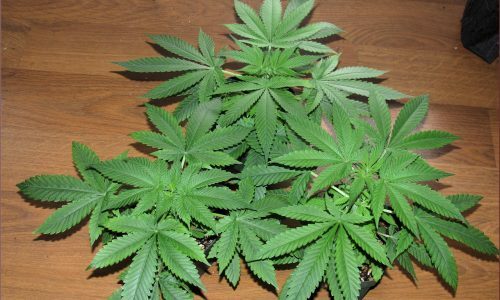 Also, these are seed plants not clones, which are tougher always in containers. I might end up having to transplant them into 3-gallon containers, but I think I can pull this off. Crossing fingers. 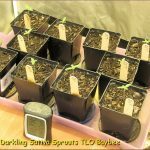 You can see in the photo the 10 Darkling Sativa sprouts (so cute) and at the time of this writing I have culled them down to 6 plants. I have had this variety before when I called them “Cindy Black” and they are right up my ally so to speak. So, I am looking forward to working them and getting some top notch wicked potent and cat-pissy sativa in my stash! Keep your shiny side up and your dirty side down amigos, I’ll catch ya all on the flip-flop next month for another Rev’s Ramble. Cheers!